News about the project and its progress. Although we’ve spent a lot of time writing articles and presenting our work at conferences, the Valuing Electronic Music project was never just about producing a piece of research for academic consumption. Our aim has always been to learn about how music is valued in the age of the internet, and to communicate what we learnt in a form that would be useful to the people most directly affected. The result is our public report. This is a short booklet with everything a musician needs to know about our research. It focuses on our main finding, which is that – even with free digital distribution via websites such as SoundCloud – real-world location remains incredibly important. Our first peer reviewed article is also available for free download, along with other documents, via the reports page of this website. Coming soon: three short films! On Thursday, 19 March, a film crew from the Open University – Matt Compton, Jim Hoyland, Holly Tighe, Siobhan Parkinson – and I interviewed speakers and attendees at the Convergence Sessions, three days of discussions and workshops held as part of Convergence 2015 in London. The crew worked wonders with the images and sound on the day of the shoot and during the editing process. Thanks to everyone who was involved, including Owen Coggins and Daniel Gouly, who observed the discussions in the main room while the film crew was interviewing. We’ll shortly be posting the three films that emerged from the interview material. I may not be able to comment extensively on them immediately when they go up, but I’ll be putting together a longer post in the near future to give them a little more context. I’ll be speaking on the team’s behalf at the 2015 conference of the Media, Communication, and Cultural Studies Association next week. My paper is entitled ‘The valuing of electronic music’, and will form part of the ‘Music and affect’ panel from 16.45-18.15 on 7 January 2015. This follows Anna’s presentation at the 5th International Conference on Computational Creativity, Byron’s presentation at the British Forum for Ethnomusicology 2014 one-day conference, Anna and Byron’s presentation at the 9th Digital Music Research Network workshop, Byron’s and my contribution to the Open University Digital Humanities Seminar Series (which was video recorded and will be uploaded to the web shortly), and my presentation to the Creative Data Club, as well as a few other presentations in private contexts – and of course the live event. It’s been really great to feel the level of interest in this research, both within and beyond the ivory prison cell. We’re going to be presenting our work on Valuing Electronic Music at the Digital Music Research Network (DMRN) workshop at Queen Mary, University of London, on Tuesday 16th December. This is the 9th running of this popular workshop and we’re very pleased to be able to discuss our work with this audience. On Saturday 29 November, we’ll be presenting our research at the British Forum for Ethnomusicology’s annual one-day conference. This year’s meeting is entitled ‘Ethnomusicology and the City’ and hosted by City University London. A pdf of the conference schedule is available here. The event will take place from 10:00 to 18:00 in the performance space on the lower ground floor of the College Building, St John’s Street, London EC1V 4PB. The nearest tube station is Angel on the Northern Line. 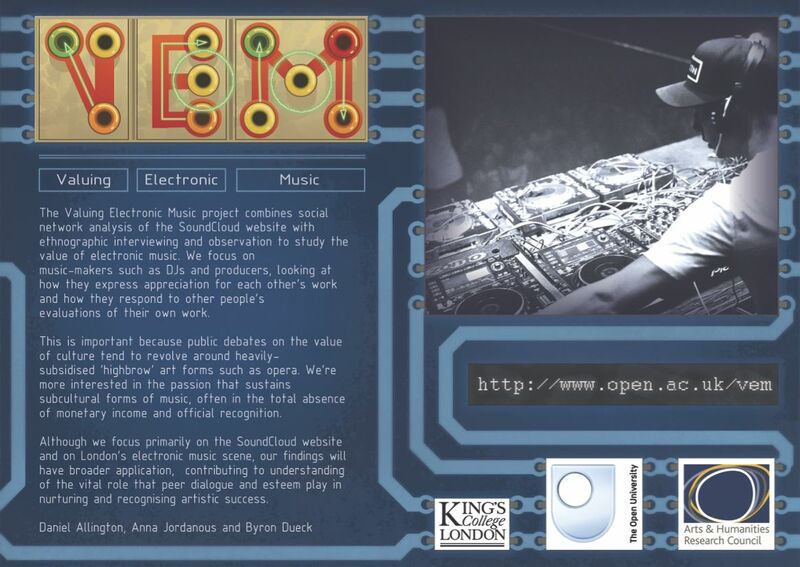 After four months at http://www.open.ac.uk/vem/, the Valuing Electronic Music website has moved to its new address, here at http://www.valuingelectronicmusic.org. 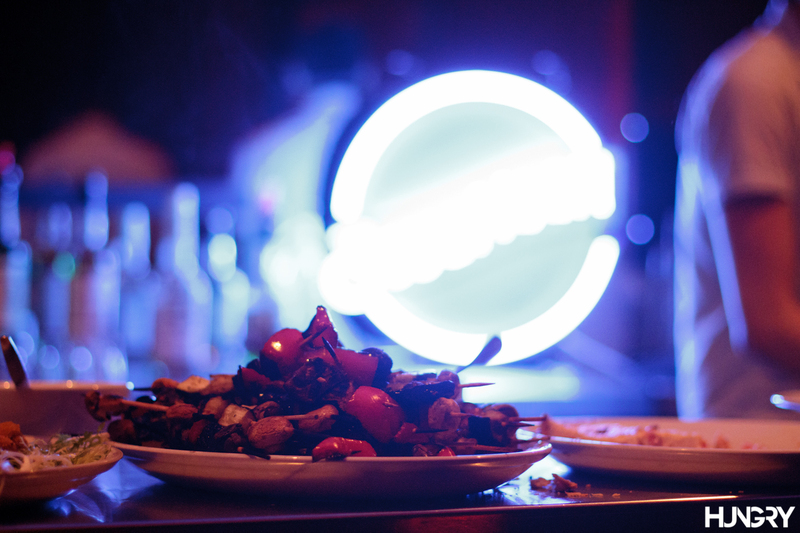 To remind you of what you experienced – or to taunt you with what you missed – here is a selection of photographs from the Valuing Electronic Music free public event, taken by Jake Davis of HungryVisuals. Wish you’d been there? We wish you’d been there too. Maybe next time! The (first?) Valuing Electronic Music public event took place on 6 June upstairs at the Lexington on Pentonville Rd in London. Which means that exactly seven days ago to the minute, I was standing in front of the mixing desk with Anna, wondering just how much longer I could credibly put off jumping onto the stage and introducing the whole thing. Thank you so much to everyone who made it happen (especially Glitch Lich, Winterlight, Slackk, Luis-Manuel Garcia, and our brilliant event producer, Josh McNorton), and to everyone who came along. Also to the people who spread the word, without whom so many fewer people would have come along. And thank you to the AHRC, because of whom the event was free. Over the next few weeks, we’ll start uploading podcasts based on the event itself and on last month’s workshop.